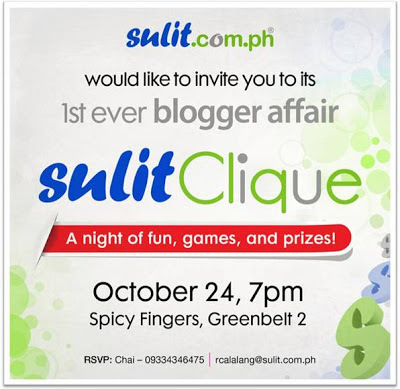 The Sulit.com.ph first ever blogger event will be held on October 24, 2012 from 7 PM onwards at Spicy Fingers, Greenbelt 2. 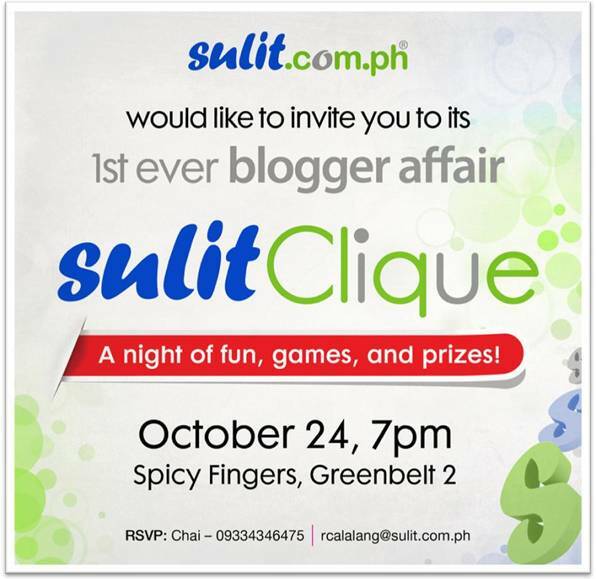 The event is dubbed as Sulit Clique, “a night of fun, games, and prizes.” There are not much details about what’s in store for the event or what exactly is it all about but it’s definitely worth attending for everyone who have been RSVP’d. Although my blog wasn’t listed on the pre-chosen blogs among those who have sent an application, I received an invitation via email for RSVP nonetheless. See photo below. If you have received an invitation, this is an event you cannot miss!